The round metal ear cups of the Manhattan Classic Stereo Headset feature well-padded, cloth-covered cushions to help buffer unpleasant sounds from the ear and enhance super-bass response. 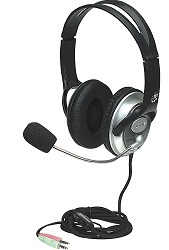 The split outer headband and padded inner sling provide a comfortable fit for almost any listener. An in-line rotary control provides fingertip convenience for quick volume adjustments to accommodate varying listening conditions. The integrated microphone with flexible gooseneck boom is ideal for instant messaging, VoIP communications and multimedia experiences. A foam microphone cover is included to help reduce "pop" and distortion for clear voice transmission. The long cable is covered with a durable nylon mesh jacket to help protect it from damage and wear. Installation and use with desktop and notebook computers is easy with dual 3.5mm dual stereo plugs.